Today is a cold rainy day where I live! It’s a perfect day to make this super easy and filling cheesy sausage casserole. It’s warm, comforting and exactly what I crave on cold rainy days! Don’t be fooled by the title and picture, while this casserole looks like a cheat meal it’s actually low carb and on the light side due to using low fat cheese! I used a spicy chicken sausage to add depth of flavor and contrast the creamy cheese and cauliflower. You could also use chicken or bulk spicy pork sausage, just make sure to fully cook it before using it! You can also play with the type of cheese. Cheddar cheese, cream cheese or Swiss could all be fun flavors to try, jut note that those will increase the calories in this dish. This is a great meal prep recipe or weekend dinner, enjoy! Heat oven to 400 degrees. Lightly grease a deep casserole dish and set aside. In a large bowl, add onion powder, garlic powder, ricotta cheese, mozzarella cheese and spinach. Stir well to combine. Add cauliflower florets and sausage and stir. Pour into prepared casserole dish and top with reserved mozzarella cheese. Bake for 20-25 minutes until cheese on top is brown and cauliflower is crisp tender. When I was a kid, I had a salad that I ordered at Applebee's every time my family went. I felt very grown up and sophisticated ordering from the adult menu, no chicken nuggets for me! I always stated my order proudly and couldn't wait to dive into a bowl of what I thought was a very exotic and adventurous Chinese chicken salad. I loved everything about that salad! It was crunchy, bright and a balance of sweet and salty that I couldn't get enough of! When the summer temperatures start to climb, I always get a craving for this cool and crunchy salad. Sadly, as an adult I learned that the salad I used to order had as many calories as a cheeseburger. So I set out to create a salad that would take care of my craving, but stay on the light side! The real secret to this salad is to make your own dressing. A bottled dressing works in a pinch, but take an extra minute to whip out this sweet, salty, spicy and savory dressing! Whisk together all ingredients for the dressing. Dressing will save in the fridge for 5 days. In a large bowl, toss all salad ingredients except lime wedges together. Evenly distribute salad between six plates and drizzle with one tablespoon of dressing. Serve each salad with a wedge of lime to be squeezed over salad before eating. Who doesn't love a good marinade? It's one of those fun cooking tricks that infuses a huge amount of flavor into your dish with minimal work! Marinades are especially helpful when cooking for meal prep as you want that dish to still have maximum flavor days after it's made. In addition to adding flavor, marinades help tenderize your protein. This is especially helpful if you purchase cheaper cuts of meat! These are my top three marinades that I use all the time! And fun tip, reduce the amount of oil in the recipe and turn these marinades into delicious sauces. I typically marinate my protein for 30 minutes, bonus points if you marinate overnight before your meal prep! 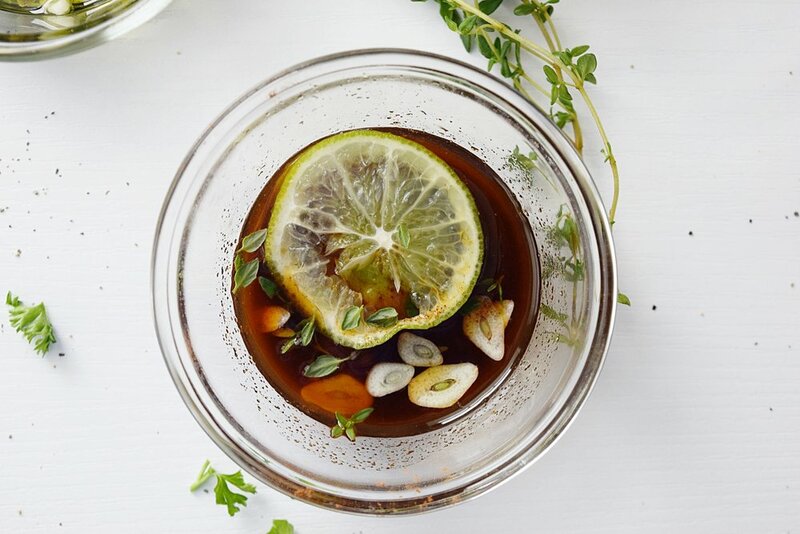 Enjoy these flavor packed, super simple marinades! Ooo this one is so bright and flavorful! Chicken and fish are perfect for this marinade. Bright lemon, fragrant parsley, garlic and salty capers make this marinade something special. Mix all ingredients together in a large bowl. Add protein and toss to coat. Marinate for 30 minutes or place in a plastic sealable bag and refrigerate overnight. If you are looking for flavor, here is where you will find it! So many aromatic spices go into this marinade that my mouth is watering just thinking about it! I use this mostly on chicken, but this marinade is amazing on everything! If you want something spicy, look no further! This powerful marinade packs a big punch. Use it on chicken, pork, beef and fish! !